The books: The Viper and the Urchin by Celine Jeanjean and The Emperor’s Edge series by Lindsay Buroker. A couple years ago, I decided I wanted to write a steampunk novel, but I’d never read any steampunk. Since then, I’ve read several dozen novels in the genre – enough to know the punks are a loose collection of genres, set anywhere from the Victorian era to the Wild West to ancient Rome. There’s steampunk, cyberpunk, futurepunk, Will Smithpunk, zombiepunk, elfpunk…basically every punk you can imagine, and then some. My favorite is probably the Emperor’s Edge series by Lindsay Buroker, set in ancient Rome with guns and steam engines and a chatty police-officer-turned-vigilante who falls in love with a stoic assassin. The first book is free, and you’ll get hooked like it’s crack. 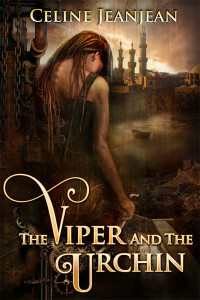 The Viper and the Urchin is the story of an assassin, but that’s where the similarities end. Longinus kills not for the thrill or for politics, but for notoriety. It’s all about his stylish reputation – so of course he’s appalled when a common street thief, Rory, not only has to help him with a job, but learns he’s actually afraid of blood. Rory wants to be a warrior swordswoman and when she realizes Longinus is great with a blade, she blackmails him into teaching her all he knows. When Longinus’s livelihood is threatened by a copycat assassin, she’s determined to get to the bottom of it, if only to continue her training. The two characters are great together. Rory is unrefined and purposefully obnoxious, and Longinus isn’t sure how to react so he ups his arrogance. The two come to deeply care about each other, but in a natural, platonic way that fits the book’s fun, lightheartedness. Even more than the excellent writing (and it really is excellent), I was impressed by the setting. Despite the main city being set in the tropics, it had the feel of Victorian London. The best thing, though, is that every character was dark-skinned. And this wasn’t a plot point, either, more a “let’s mention it in passing because it’s not a big deal; it’s completely natural for this part of the world” point. As someone who’s hypersensitive to the lack of diversity just about everywhere, I really enjoyed this little extra (although it’s not really reflected on the cover). One of the best parts, though, was that I didn’t predict the ending only 25% into the book. I figured it out halfway through but thoroughly enjoyed the author’s bit of misdirection. I enjoyed the whole book and highly recommend it. The accompanying music choice is actually why this post is so late. I bought my first Placebo CD 18 years ago – it was the first CD I bought online, because I couldn’t find it locally. I hadn’t listened to them in a couple years, so while trying to pick a song I ended up just sitting and listening to all their albums. iTunes tells me they’re “alternative and punk,” and their drums certainly are. Maybe some of the guitars too? Although lots of their songs fit, I finally settled on “The Bitter End.” It encompasses a lot of themes from the book, like the mix of emotions Rory feels after being screwed over by her partner and the hopeless resignation Longinus feels when he realizes who’s trying to steal his identity.